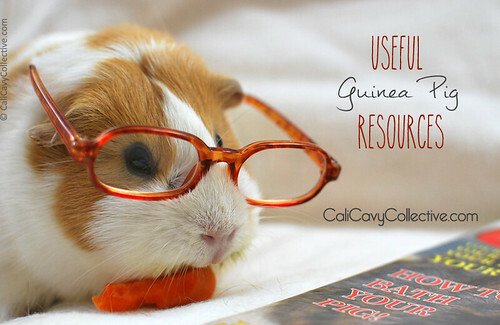 Here's a comprehensive list of guinea pig resources that we find useful, helpful, or entertaining. (Last updated 3/2014.) Enjoy! 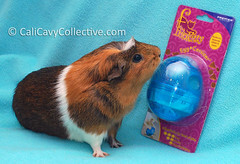 A must read for new and current cavy owners alike, Guinea Lynx is the leading guinea pig care website. It offers information on many aspects of piggy care including nutrition, housing, health tips, explanations of common and uncommon health signs to look for, detailed explanations of common diseases, and guinea pig safe medications. A necessary read for any guinea pig owner, with great info by Charybdis and Pigglies from Guinea Lynx. Good to read their advice and be prepared, regardless of whether or not your cavy is currently ill! Useful info listing common symptoms and their possible causes. Becoming familiar with these signs of illness is fundamental for your guinea pig's long term health. 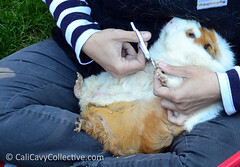 Well known in the online and UK guinea pig community, Peter Gurney set up this website as a care guide dedicated to covering common guinea pig ailments and treatments (both with and without the use of prescriptive medications). His main website can be found here. Natural, quality skincare products designed specifically for guinea pigs. They carry an excellent range of shampoos to suit every pig, whether your concern is fungus, parasites, sensitive skin, conditioning, or washing a pregnant sow (our favorite is the Just For Boars label). Their website also has a useful section on identifying skin problems, complete with symptom descriptions and a picture gallery. 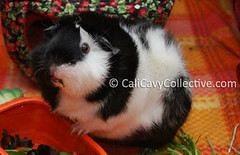 Lists of foods that are safe for your guinea pig to eat, as well as poisonous plants to avoid. Links to food charts include nutrition info for various vegetables and fruits. An article with advice on how to find and choose an experienced cavy vet, including questions to ask. A directory of vets, categorized by country and state. Provides forum members recommendations and experiences. Producer of fresh high quality hay and pellets. Depending on seasonal availability they offer 2nd cut timothy, 3rd cut timothy, and bluegrass hay. They also sell both timothy and alfalfa pellets. Everyone's favorite! Another purveyor of quality timothy hay. Currently they offer 2nd cut timothy. Producer of the nutritional supplement "Critical Care", an essential addition to every cavy owner's emergency kit. A comprehensive guide to using fleece in your cavy's cage. A one stop resource for everything you need to know: preparation, cleaning, burrowing, and more. Offers reusable bedding, cage liners, cuddle cups, tunnels, and other cage accessories for your guinea pig. Affordable pre-made C&C cages are also available here. This pro-rescue shop offers a variety of care and grooming items, including nail clippers, syringes, Oxbow Critical Care, Vitamin C, Ivermectin, and shilintong. Great to have in your pig's medical kit. Offers faux sherpa fleece beds embroidered with cute cavy related designs. All the pigs here love snoozing on these fluffy cushions, which are especially cozy when placed inside a pigloo. Sells cozies, cuddle cups, cage liners, lap pads, and guinea pig shaped cookie cutters! 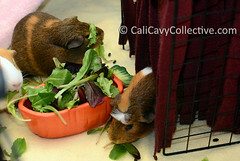 The shop is run by Orange County Cavy Haven volunteers. Proceeds benefit the rescue. Offers customizable fleece cozies, condos, cuddle cups, cozy sacks. They also sell cute greeting cards and calendars. Sells fleece corner cabins, hammocks, tunnels and more. The pigs adore scampering in and out of the two portholes in their cube house. Sells fleece beds, tunnels, cozies, lap pads and more. Custom sets and cage liners are available here. 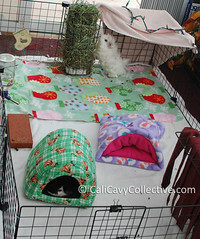 Sells customizable fleece cage accessories, including houses, cozies, cuddle cups, hammocks, tunnels, and couch beds. Their pumpkin and acorn houses are especially popular with both piggies and owners. Wondering where you can go to adopt guinea pigs? Find your nearest rescue organization by using GL's extensive directory. Here you can find links to cavy rescues and shelters from all over the world. Searchable by country and state. 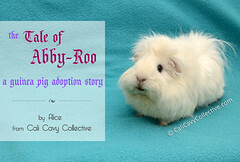 Simply enter your location and choose type "Small & Furry" to search for adoptable guinea pigs near you. Craigslist and your local Humane Society may also have guinea pigs waiting for a forever home. 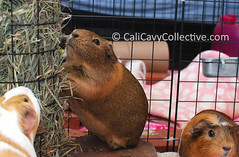 Excellent information on cavy-cavy interaction, guinea pig-human bonding. Their section on introductions and dominance behavior are a must read if you are looking for a companion for your pig. Great page describing different guinea pig vocalizations and their causes/meanings. Includes audio clips. The goal of this wonderful site is to raise funds for special needs pigs. 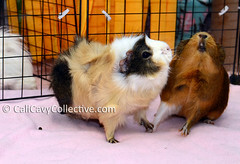 A different cavy or bonded pair from rescues and shelters is featured every month. Since these organizations take in otherwise unadoptable animal whom would be put to sleep without their help, these special needs pigs often require additional medical care. A dollar can make a difference! Excellent article by HappyCavy with helpful pointers on finding a pigsitter. Also includes interview tips. Looking for more guinea pig blogs? Check these out! Watch the Happy Cavy guinea pig herd via three live stream web cams - much better than TV. Piggy fun and games, including guinea pig checkers, tic tac toe, and even jigsaw puzzles. There are also comic pictures, piggy drawing tutorials, and a short quiz to test your cavy knowledge. Cute cavy maze puzzles. Can you help the piggy navigate through the maze to the veggies?